The sun is shining and the snow is melting — which means it's time to start your spring cleaning. Between the buckets and the sprays, cleaning the whole house can be a major task, so we don't blame you for wanting to taking a few shortcuts here and there. But if you're trying a trick you found online, you might not be getting all the information you need. Cleaning mistakes (like washing the windows on a sunny day) are common and cost you time and money, reports Real Simple. To make the most of your efforts, the experts at Molly Maids, a cleaning service company, aren't just dustbusting, they're myth-busting too. They let us in on which cleaning methods really work and which are just misconceptions. TRUE: A truly green alternative, lemons are a great way to safely remove water stains from glass and chrome in the kitchen and bathroom. Their acidity breaks down stains while also releasing a fresh clean scent. 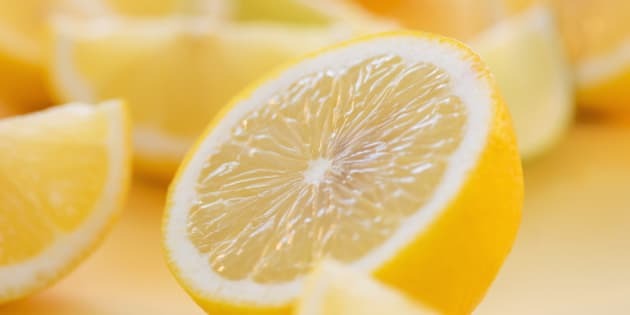 Simply rub a lemon on the stain and then rinse. Also a great way to remove general grunge from around faucets. Myth: Bleach is The Ultimate Cleaner. FALSE: Bleach doesn’t clean so much as it disinfects. Bleach does a great job killing bacteria, and also removes tough stains. But bleach doesn't really clean dirt and residue from surfaces. To do that, you need to scrub and rinse the surface with a cleaning product. For many household cleaning jobs, bleach just isn't the right choice. It has heavy fumes that can make you sick, as well as damage and remove colour from some surfaces. FALSE: We often associate freshness and cleanliness with fragrant scents. But sometimes the fragrance may just be covering up the actual problem. It’s been proven that scented and unscented versions of the same product clean equally well. The best way to know whether a surface is clean is to do the touch test. If it feels clean and looks clean, chances are you have sufficiently removed dirt and grime from the surface. TRUE: A window squeegee does a great job at removing pet fur from carpets and furniture. Pet hair from dogs and cats can be hard to remove once it has become embedded in the fibres — even with a vacuum. The solution? A simple window squeegee. Use the rubber blade to rake up the pet hair. Once most of the pet hair has been successfully removed, a vacuum should be able to finish the job. TRUE: For natural furniture scratch repair, just take the meat of a walnut (not the hard shell), and rub it gently on the scratch in the wood using a circular and up-and-down motion. The walnut will release an oily substance, which should also be rubbed into the scratch. It is these natural oils that help repair the wood. A quick polish and the scratch should be gone. FALSE: An ordinary cleaning cloth has fibres made of cotton or a synthetic material such as nylon. The fibres in these fabrics are quite large. But a microfibre cloth has far more fibres and they're much smaller. Microfibres are able to attach themselves to even the smallest, most microscopic dirt particles — ones that ordinary cloth fibres simply brush past. FALSE: Citrus peels may temporarily eliminate nasty scents from the garbage disposal. However, if they aren’t completely ground up, they will eventually contribute to the bad smells wafting from your sink. Citrus peels can clog your drain and corrode the metal in your disposal. It’s safer to pour a few teaspoons of white vinegar into the disposal instead. TRUE: This sounds strange, but there is truth to it! Take an ice cube and place it in the stubborn carpet dent for a while, then fluff it with a fork to get the fibres looking good as new. TRUE: Plant experts tell us that specific varieties do a great job purifying the air in our homes. Plants such as rubber trees, corn plants, bamboo palm, ficus, gerber daisies, english ivy, peace lily and philodendrons are great picks. TRUE: This is a popular one. It seems impossible that a sheet of paper covered in ink could clean anything, but it has been a contractor's trick for years. Using newspaper on windows leaves no streaks, is absorbent and easy to maneuver around the window. The lack of lint on newspaper (vs. paper towels or an ordinary cleaning cloth) is the key. FALSE: The argument here is that the rotating brush in a vacuum can pull, stretch, and wear out carpet fibres. However, this is untrue. Dirt puts more wear and tear on our carpets than most vacuum cleaners ever could. That being said, it is possible to overwork your carpet. If your vacuum cleaner has multiple settings, be sure to use it on the correct one. Don’t use the bare floor setting when vacuuming the carpet. TRUE: Natural cleaning methods are just as effective as their chemical counterparts but may need to be used differently. Some natural cleaning methods need to sit and soak for maximum efficacy. That said, they definitely do the job when tested. For example, white vinegar not only cuts through grease, but has acidic properties that can create an unfavourable environment for mold and bacteria. Those who make the switch to natural cleaning products find that they can remove stains from clothing, scrub tough grease out of dishes and sanitize their kitchens and bathrooms without using dangerous chemicals. TRUE: Surprising but true. When you add equal parts of white vinegar with baking soda, clogged drains beware! Simply sprinkle ½ cup of baking soda down your clogged drain, followed by ½ cup of vinegar. Cover with a cloth and wait 5 to 10 minutes before flushing with very hot water. Drains should be clear. FALSE: Using cold water to wash our clothes is a great way of saving energy and money on our monthly utility bills. It also keeps clothes looking new and fresh longer. However, sometimes hot water is a must. Using hot water helps to kill bacteria, mold and viruses. So, when washing your undergarments, bed sheets, bathroom towels or anything else that may be filled with germs, it’s a good idea to turn the dial to hot.